I absolutely love Anne Shirley. And the Megan Fellows adaptation is one of my favorite movies period. But I must admit, I have read only about half the series before. So I decided to change that this year and read all 8 books in the series. And I would love you to join me! 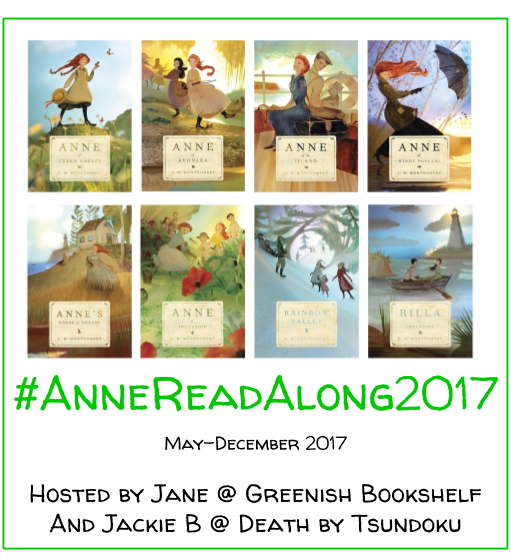 Post your own introductory post about the #AnneReadAlong2017 on your blog. Include a link of your post in the comments of my introductory post here. Tell your friends about our read along! Each month starting in May, we will read and review one book from the Anne series. See the chart below for more details. Not sure if you can read all 8? No worries! Join us for as many as you can! Post your reviews on your blog, website, youtube channel, etc AND link them to our monthly posts. Read and comment on other Anne lovers’ posts. What can I post about? Anything and everything related to the Anne series! Be sure to link up your posts on our monthly review posts. We will post monthly reviews as well as host monthly Anne Top 5 posts, post our thoughts on various Anne related topics, and host several giveaways! More info on our Anne Top 5 Bonus Posts can be found on Jackie’s post here. Any questions? Send me an email at janepotter1000(at)gmail(dot)com.